If you've been living in the Fairview QC area, you would definitely be familiar with the latest salon that I'll be featuring. I get to pass by it everyday back when I was still commuting to school but I haven't had the chance to actually visit it until I had my makeup done there for my Oathtaking and Signing of the Roll this year. Anyway, I was invited a few days back to try out their services (which I'll be reviewing in another blog post). 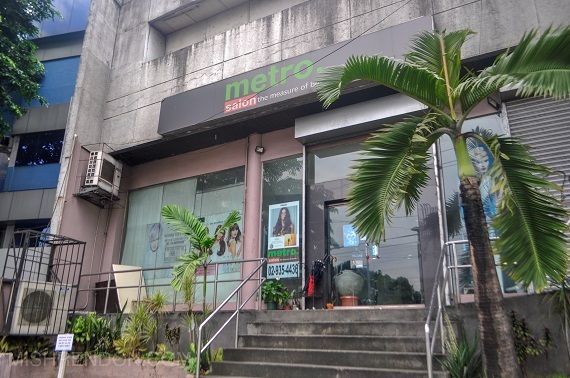 Retro Salon (formerly known as Metro Salon) has been open for years now and has been serving the area with various salon services for quite a long time now. 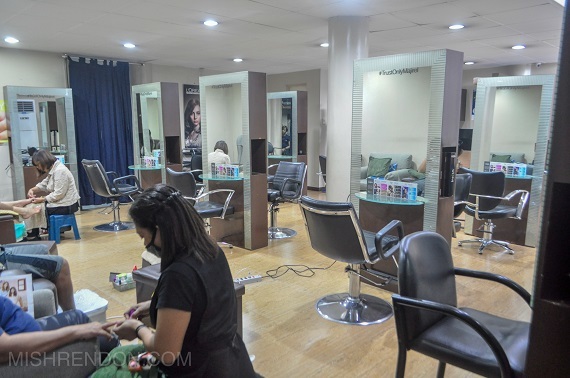 The salon has been recently placed under a new management and there have been definitely tons of changes that was implemented, most especially when it comes to their services. When it comes to their interiors, I found it spacious and well-lighted. The decors and seats were simple and practical but it has a homey feel to it - something you'd go back to over and over again. 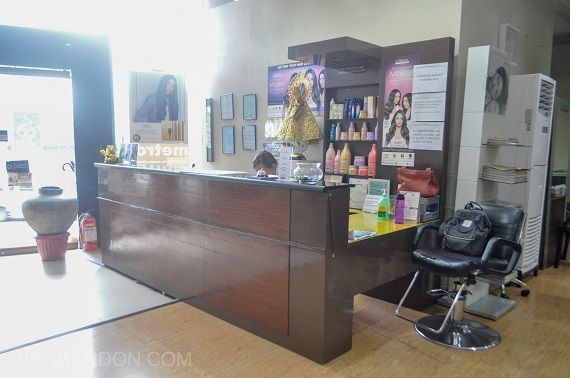 During my recent visit (which was on a Tuesday afternoon), the place only had several clients having their nails done and their hair cut done. But when I had my make up done (I think it was on a Friday morning), the place was packed and busy. From what I have noticed and based on how the stylists and staff would know them by their first names, people that visit there are mostly long time customers. 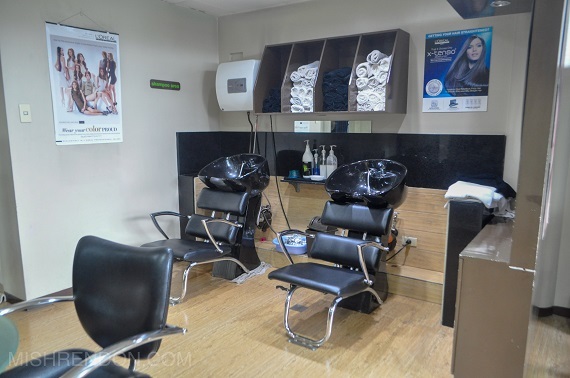 If there is anything that Retro Salon has maintained, it is the staff that they previously had, such as their stylists and personnel, whom have already gained their clientele from all those years of service. I think this factor helps maintain the quality of the services that they offer. I think that most of the improvement about their services takes place in their equipment and tools. They only offer quality hair products such as Loreal and Schawarzkopf for treatment and color. Whereas they only offer premier makeup such as MAC for their hair and makeup services. Of course, prices have increased a bit but I think it is all worth it. Recently, they launched two new services - the Loreal Steam Bond and the Brazilian Keratin Blow-Dry. 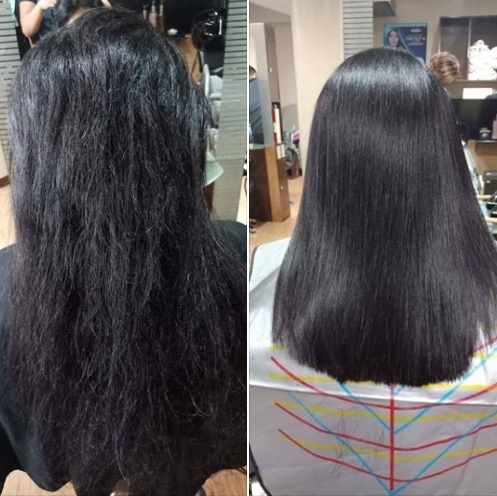 The Brazilian Keratin Blow-Dry aims to repair, moisturize, protect, and infuse dull hair with keratin and vitamins to achieve that smooth, healthy, and well-conditioned shiny hair. If you opt to achieve that straight and shiny hair of your dreams, the Loreal Steam Bond uses the world's first steam smoothing system, which delivers a continuous and high pressure steam that permanently straightens the hair without any hair breakage and damage to hair. 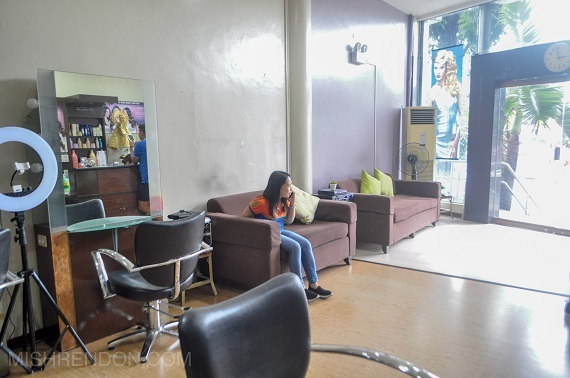 If you are looking for a salon to rediscover within the Quezon City area, you may visit Retro Salon Fairview at Angelenix House, Commonwealth Corner Camaro Street, Novaliches, Quezon City. 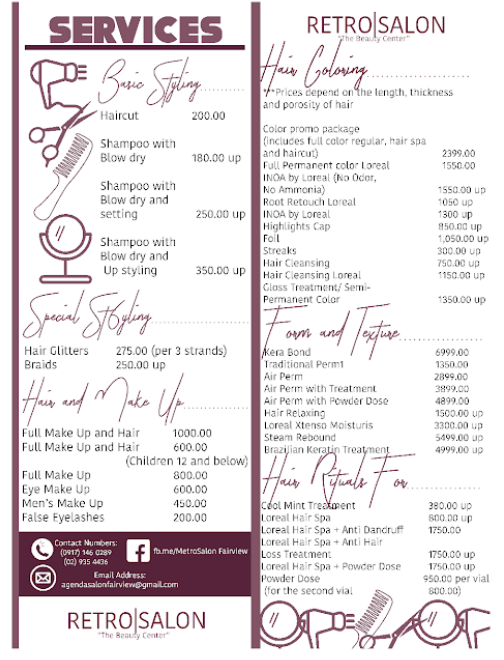 You may call them at (02)9354436 or (0917)1460289 for more inquiries and to set an appointment. Don't forget to check out their Facebook page at https://facebook.com/MetroSalonFairview.